Emory poet and professor Jericho Brown releases his new book, “The Tradition,” on April 2 and reads at Emory on April 3 at 6:30 p.m. Courtesy photo. 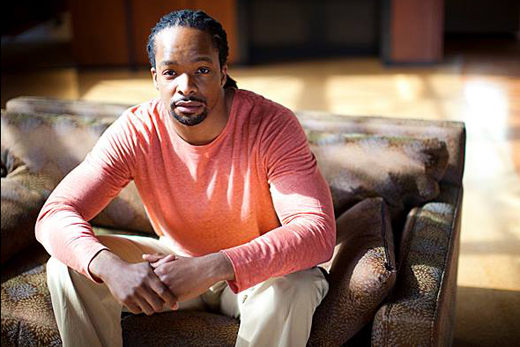 Poet Jericho Brown, Winship Research Professor in Creative Writing and director of Emory’s Creative Writing Program, reads from his work Wednesday, April 3, at 6:30 p.m. in the Cox Hall Ballroom. A reception and book signing will follow the reading. Brown’s work has appeared in the New York Times, the New Yorker, Buzzfeed and more; his new book, “The Tradition,” will be released April 2. On Wednesday, April 24, in the Cox Hall Ballroom at 7:30 p.m., join the Creative Writing Program and English Department for their annual Awards Night. The winners of student writing contests and scholarships read from their work. It’s Monsieur Hulot’s birthday and everyone is celebrating… even his ghost! “The Tatischeff Café” is a comic pantomime with music, magic and a host of eccentric characters in tribute to the great filmmaker and mime Jacques Tati, created by Theater Studies professor John Ammerman. This production runs April 4-14 in the Mary Gary Munroe Theater. Tickets are $15; $12 discount categories; $5 all students. Music Department students perform recitals throughout April. This month’s lineup includes performances from Catherine MacGregor (April 3), Zola Carina Berger-Schmitz (April 13), Akshatha Achar and Gabe Hart (April 14), and Jason Lin and Elizabeth Sun (April 20). Called “adventurous and passionate” by the New Yorker, Ukrainian-born American pianist Inna Faliks has established herself as one of the most exciting, committed, communicative and poetic artists of her generation. Hear Faliks play on Friday, April 12, at noon in the Carlos Museum. The Emory Concert Choir is considered to be one of the finest collegiate choirs in the country. On Sunday, April 28, at 7 p.m., the Emory Concert Choir conducted by Eric Nelson, Emory College music professor, performs in Emerson Concert Hall. The Department of Film and Media studies continues its spring Cinematheque series, “Glorious Color!,” Wednesdays at 7:30 p.m. in 208 White Hall with “McCabe and Mrs. Miller,” “Distant Voices, Still Lives,” “The Aviator” and “Speed Racer.” All Emory Cinematheque screenings are free and open to the public. Guest artist Boris Richir teaches a master class on Paris Opera ballet technique Wednesday, April 17, at 7:30 p.m. French technique, and more particularly the “Paris Opera Ballet School way of teaching,” results from a 300-year-old tradition passed down from teacher to student. There is no written curriculum and the technique and style are only transmitted orally. Do not miss the one weekend run of the Emory Dance Company Spring Concert, in which dancers perform new works by student choreographers. This event runs April 25-27 at 7:30 p.m. and April 27 at 2 p.m. in the Dance Studio of the Schwartz Center for Performing Arts. Sunday, April 14, experience birds in the woods, in galleries, in song, and more. The Carlos Museum, the Atlanta Audubon Society, the Emory Chamber Music Society of Atlanta, Theater Emory, the Emory Planetarium, and the Emory Libraries invite you to a celebration of birds across the arts. Click here for the full list of events. Okorie “OkCello” Johnson is an Atlanta-based cellist-composer whose music integrates cello, live-sound-looping and improvisation on original compositions which collide classical with jazz, EDM, reggae, and funk. On Saturday, April 27, at 2 p.m., Johnson will collaborate with children in a musical response to three masked figure Egunguns in the Carlos galleries. The music created by the children will be incorporated into the OkCello concert that follows the Children’s Workshop: Making Music with Okorie at 4 p.m. This event is for elementary and middle school-aged children. The fee is $15 for Carlos Museum members; $20 for nonmembers.